The Instituto de Matemática Pura e Aplicada (IMPA) in Rio de Janeiro is celebrating the 60th anniversary of its foundation, by a 1952 decree of Brazil’s national research agency, CNPq. Over the years IMPA grew to become the best research center in Mathematics in Latin America, and one of the best worldwide. It consolidated its scientific prestige and became a reference for research in Mathematics and training of new researchers in Brazil and in Latin America. As a graduate school, IMPA has formed about 375 doctoral students who are now active throughout Brazil and the countries in the region, thus crucially contributing to the development of Mathematics within and beyond the national borders. 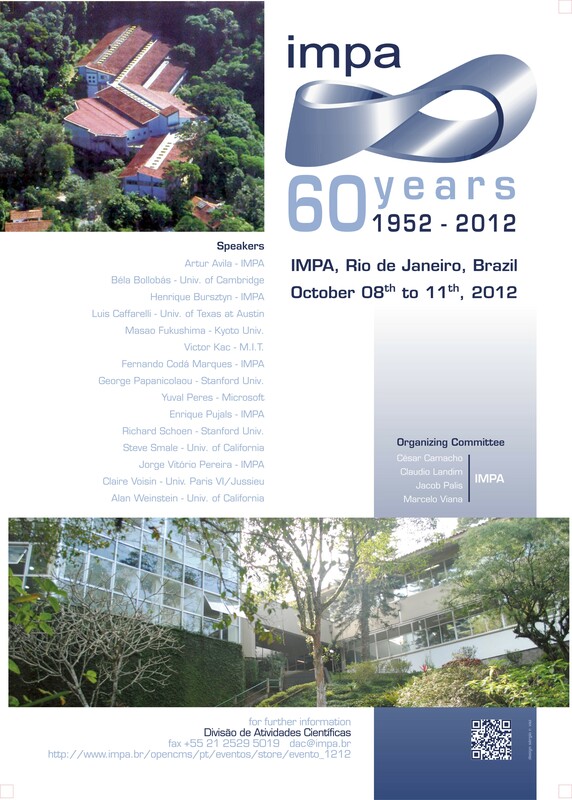 To mark the date, an international conference will be held at IMPA in October 8-11, 2012, with the participation of about 200 foreign guests, including Fields Medal winner, Steve Smale and Nobel Prizer winner, Eric Maskin, besides a substantial number of Brazilian and Latin American mathematicians. The program includes about 17 plenary lectures in a wide spectrum of topics in Mathematics and its various applications. Financial Support: September 20, 2012. What is a non-local Poisson bracket?